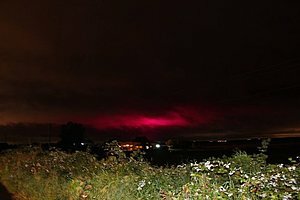 The mystery surrounding why the skies turn a bright shade of pink over Merseyside (North West England) at night has been revealed. Many people have been left scratching their heads as to what the shocking fuschia coloured spectacle is. And you could be forgiven for thinking it is the result of some bizarre natural phenomenon. But the answer comes down to... tomatoes. Tomato plant Flavourfresh Salads, in Scarisbrick, has for the past year been using LED lights to help aid the growth of its award winning tomatoes.The lights, which are a mixture of blue and red, are used in the greenhouses and when combined appear bright pink. When on, they can be seen for miles with people claiming to have seen the pink colour in the sky from Southport, Formby and even as far as Kirkby.